Finley can read(ish)! I've been trying various methods of teaching Finley to read for awhile now, and a month and a half ago it all clicked and now he is quite the eager reader. We have some BOB Books, 100 Lessons to Teach your Child to Read--but what really got him excited was this little set of Curious George books. Since then, we've accumulated a set of Berenstain Bears books, Batman and LEGO ones. He just LOVES reading the stories about the characters he's interested in. And he's so proud. It's darling. He's has more and more sight words memorized every day (thanks to his favorite game POP!) and is pretty decent at sounding things out. 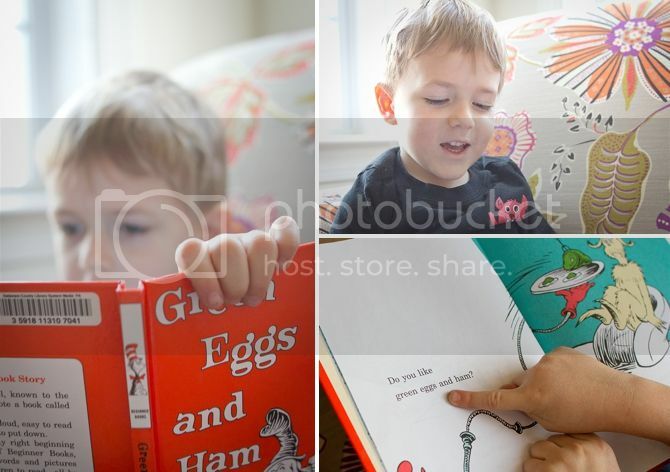 Teaching a kid to read is a good reminder of how tricky the English language is--just as I have him remembering the "oo" sound in words like "pool"... "good" sneaks up on us and breaks all the rules. 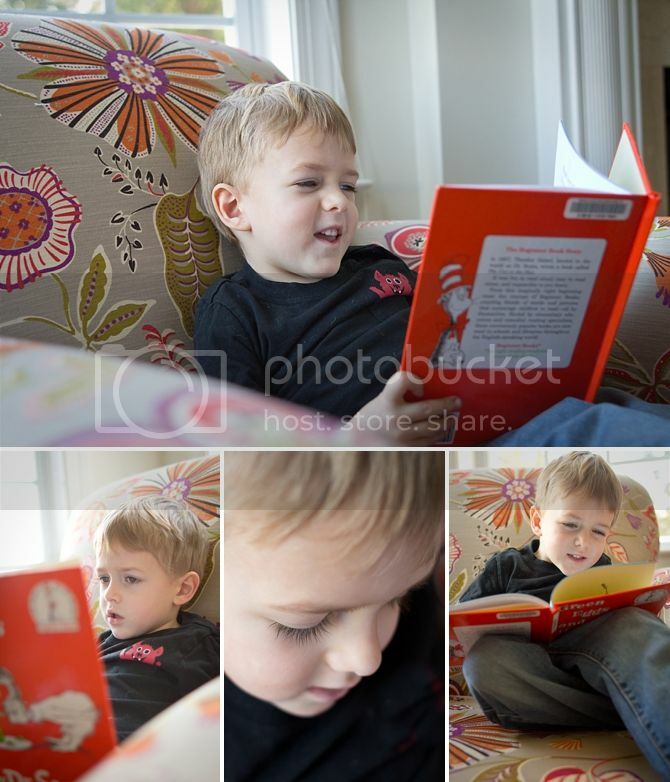 Lucky for you, I have a ten minute video of Finley reading a Berenstain Bears book. Highlights include: a shot of a very happy Keaton after almost every page and Finley displaying some excellent reading comprehension skills--making sure he understands each sentence after he reads it and asking questions. I'm a proud (math) teacher. It was a bit challenging to help him sound out words with my hands on the camera (and it was taking forever) so I cheated and helped him out a few times. Also, have you read Green Eggs and Hams lately? It is LONG. But he can read the whole dang thing by himself and it's adorable. 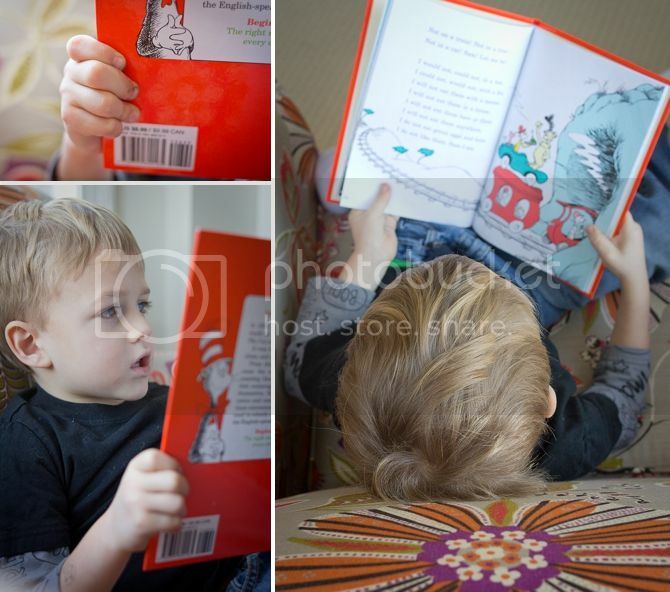 Sometimes he gets going too fast and switches his withs and woulds and wills--like all beginning readers he has a hard time slowing down and actually reading the words, rather than guessing. My favorite part is watching him crack up after he reads something he thinks is especially funny. It's a fun new stage we're in--he's constantly trying to read the words around him and asking me what different letters spell. He has a growing collection of words he can spell on his own and loves to write us notes with them. (Mainly, they said "I LOVE YOU MAMA, FROM FINLEY" but is there anything precious-er? I know that's not a word, Finley has a great vocabulary, not me.) 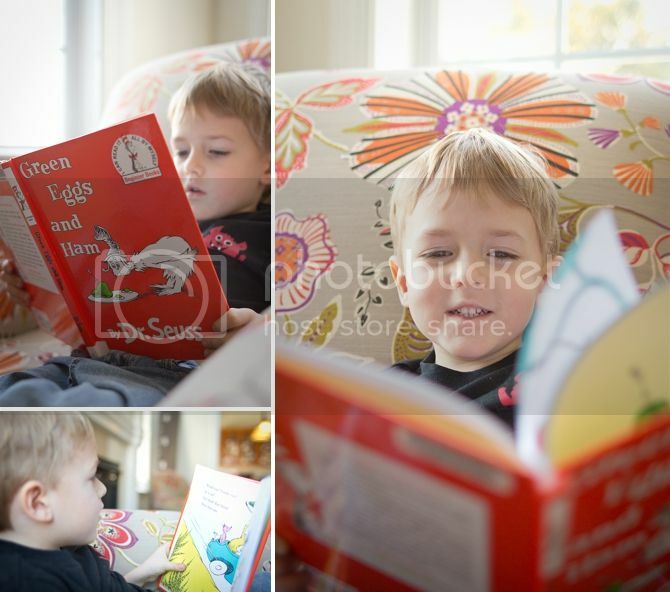 I've started reading him chapter books as well--we've finished two of the Boxcar Children books and he loved them! I was surprised they held his attention, but I think the thing about kids is that they always exceed your expectations. If you have any great chapter books for young boy recommendations, I'd love to hear them! My mom will love this post! Also, I almost asked about the game POP. I followed the links to all the reading stuff and made an amazon wish list for the kids when they start reading! Yay! That is awesome. Kenneth and Di both loved the Boxcar Children books. The Matt Christopher books are good sports ones, and of course my favorite Henry Huggins. Too hard for him now, but good to read. Also, a new PattySue is about to be launched! Maybe it will become his next favorite. That's awesome! What about Stuart Little? Charlotte's Web? Kids a little older are very in to the Magic Treehouse beginner chapter books. I'm a huge reader (well, I used to be) and love this stage so much!